The aim of this conference is to explore the (trans)formation of cultural hierarchies in Western literatures during the twentieth and twenty-first centuries. More specifically, we want to reexamine the boundaries and interactions between low, middle and high culture, paying special attention to how middlebrow culture developed as a distinct cultural sphere somewhere in between high and low, with its own protocols and practices. Given its central role in cultural practice, the notion of cultural hierarchy has been a topical subject in the humanities. The subject has proven to be capable of generating fundamental dissension amongst scholars and has often been essential to the emergence of new directions in cultural research. Traditionally, cultural hierarchy has often been thought of in terms of strong dichotomies, oppositions and exclusions. Recent decades, however, saw the rise of a wide array of approaches (inspired, for instance, by the emergence of postmodernist aesthetics, cultural studies as a discipline, and new modernist studies) that have stressed the complexity of all sorts of interactions between high and low cultural products, genres and practices. Of special importance for this conference is the rapidly growing interest in middlebrow culture, a vast and largely unexplored cultural domain beyond the ‘great divide’ (Huyssen), which came into being more or less simultaneously with the advent of modernism, and which has its own functions and forms, institutions and cultural products. The domain of middlebrow literary culture includes, for example, popular magazines, fashionable book series, the bestseller, literary radio and television programs, and different forms of book reviewing and educational organizations that aim at making (high) literature accessible to a wide audience. These cultural objects and practices were often closely related to changes in not only cultural hierarchies, but also in socio-economical hierarchies, such as the rise of new middle classes and changes in gender relations (the increasing number of female authors and participation of (young) women in the labour market). 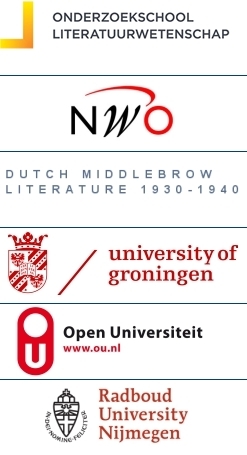 This conference will be dedicated to the exploration of the dynamics of middlebrow literary culture, not only by taking stock of its diverse manifestations (texts, genres, authors, publishers, critics, etc. ), but also by relating these phenomena systematically to the broader issues of cultural hierarchy and the interaction between different cultural segments and strata. Vice versa, it wants to complicate existing views of these hierarchies by introducing hitherto largely neglected practices and discourses, such as the institutional and textual characteristics of bestsellers, middlebrow novels, popular book reviews and pedagogical initiatives. Hence the conference addresses general topics concerned with the genealogy, function and infrastructure of cultural hierarchies and middlebrow literary culture next to concrete practices and discourses: how were cultural hierarchies produced and how did they change over time, how were different cultural domains situated vis-à-vis each other, which institutions were shaping these hierarchies, organizing and policing the separate cultural domains, what was the role played by (new) media, what cultural practices and discourses were devised in connection with these infrastructural changes and do cultural hierarchies still play an influential role nowadays, or are they ever-more dissolving? On the first day of the conference, we will discuss the role of media and institutions in spreading culture and knowledge and in contributing to the establishment of new cultural practices. The twentieth century saw significant changes in the media landscape, such as the unparalleled growth of (popular) magazines and newspapers, the increased use of illustrations and photographs, the rise of new media and institutions, mainly radio, television and the Internet, accessible educational programs and the movie industry. Key questions include: How did the rise of these new media and institutions or significant changes in existing media challenge contemporary hierarchies during the twentieth or twenty-first century? How did these changes facilitate the creation of new literary (sub)cultures? During the second day, we want to look closely at the texts and discourses that are involved in the creation of cultural hierarchies or are typical of a certain (sub)culture. Instead of approaching cultural hierarchies primarily in terms of the media or institutions that produced them, we will consider the intrinsic textual properties and characteristics of literary objects, such as novels, book review, short stories, feuilletons, essays and advertisements. The central objective of this day will not be to classify these texts or enlist their defining stylistic characteristics, but to situate them in a larger discursive context and economy. Key questions include: How did these texts relate to different notions of genre? What can textual analysis tell us about how they were produced and distributed and how they tried to reach specific reader audiences?